Once you get your Kindle Fire HDX 7 or Kindle Fire HDX 8.9, the first thing you should do is to connect to internet and check for update. Very likely, the pre-installed OS is Fire OS 3.0, and you should update to Fire OS 3.1. to enjoy all the goodies of Kindle Fire HDX. Although Fire OS 3.0/3.1 is based on Android 4.2, you will not find any trace of Android or Google in the interface. The customization is amazing. You will never feel the lag as you may experience in many Android tablets. Of course, the 2.2GHz Qualcomm Snapdragon 800 processor and 2GB of RAM in Kindle Fire HDX 7 and Kindle Fire HDX 8.9 also play a role. Both Kindle Fire HDX 7 and Kindle Fire HDX 8.9 are equipped with dual band (2.4GHz and 5GHz), dual antenna (MIMO) Wi-Fi. If your router supports dual band, try 5GHz, which is usually faster than commonly-used 2.4GHz. You is able to enjoy not only faster connections, but also fewer dropped connections, In addition, Kindle Fire HDX 7 and Kindle Fire HDX 8.9 can easily pick up the connection when signal is not strong. 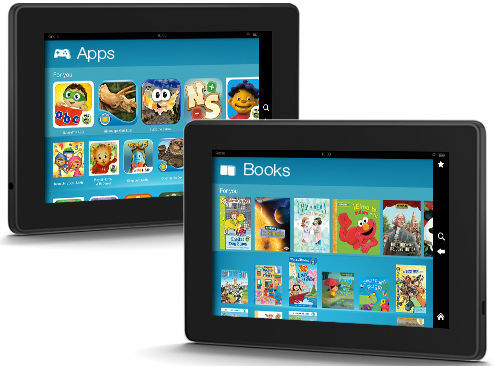 Amazon names the new Kindle Fire tablets with HDX for some reasons. First the screen resolution is 1920*1200 (for Kindle Fire HDX 7) or 2560 x 1600 (for Kindle Fire HDX 8.9). It is beyond full HD (1920*1080). The 16:10 ratio is better than 16:9 for reading. The most outstanding improvement in the display is its brightness and color accuracy. It is one of the most tablet display in the market. You cannot believe it is a $229 tablet (7″). It is as bright as Samsung’s AMOLED screens in some smartphones, but the color is far more natural. To enjoy a movie, it is best to watch on a big screen, for example on a TV. Now, with Kindle Fire HDX 7 and Kindle Fire HDX 8.9, you can simply mirror whatever you have on the screen to the TV through display mirroring. Although most people use this for video or games, it is not limited to them. The display mirroring can be used for everything: sharing a website, showing your holiday photos or even business presentation. Note the display mirroring is not just for display. The audio is also transferred to the TV automatically as well. So, you can easily enjoy all videos or music in your home theater system. Of course, to use display mirroring, you need a TV with Miracast support. If not, you can get a Miracast dongle. You may check our Kindle Fire HDX display mirroring guide (coming soon!) for detailed info. If you are not a member of Amazon Prime, you can instantly start the free one-month trial. You get all benefits: free 2-day shipping, watch or download tens of thousands of popular movies and TV shows, and borrow an Kindle book each month. Amazon Prime probably is the best content deal you can find. If you compare it with Netflix, Hulu Plus, you will find Amazon Prime provides the most value for your $79 (for one year). Kindle FreeTime lets you share the Kindle Fire tablet among your family members, even guests without losing privacy. Essentially, Kindle FreeTime allows you to create different profiles for different users. You can choose content you’ve purchased for each of your children on your Kindle Fire HD, Kindle Fire HDX 7, or Kindle Fire HDX 8.9. You control over what content each child can access. Most kids actually prefer the Kindle FreeTime interface, because they can seamlessly switch between apps, books, movies, and TV shows in a simple way. Kindle FreeTime is totally free. The app is pre-installed on your tablet (new Kindle Fire HD, Kindle Fire HDX 7 and Kindle Fire HDX 8.9). You just need configure it. We will create a detailed guide for you soon. If you have kids aged between 3 and 8, Amazon offers you the best value of contents for kids: books, videos, and apps. Most importantly, the contents are specially filtered for the age group and there is no ads, no in-app purchases. Kindle FreeTime Unlimited is an optional monthly subscription (add-on) for Kindle FreeTime. By paying $3/month, your kids can access thousands of books, apps, movies, and TV shows for children ages 3-8 years old. The contents are updated regularly. This can save you thousands dollars each year for purchasing contents for young kids, who may even not like. You can try it for one month on your Kindle Fire tablet. Please subscribe to our newsletter to get the latest update on Kindle FreeTime Unlimited. Or read our Kindle FreeTime Unlimited guide (coming soon). Amazon cloud may be not so well-known outside the Kindle Fire users. You have 5GB free storage for any of your files. It can be accessed from your PC, iOS devices or Android devices. Of course, you can access it from your Kindle Fire tablets. You can save all of the purchased apps, music, games, books, videos on the cloud. Such contents will NOT be counted. This means you can have a full backup of all your Amazon contents for free. Amazon Appstore may be small compared to Google Play store. But Amazon offer one free app everyday. Such apps may cost you a few dollars beyond that day. For some of these features, we will have a detailed guide. So do check our Ultimate Guide of Kind Fire For Kids page frequently. Also, don’t forget to subscribe to our free newsletter Kindle Fire For Kid Guide, to get the latest update and guides. What do you think about Kindle Fire HDX7 and Kindle Fire HDX 8.9? Do you have any questions on giving it for your kids? Let us know in your comment box below. Reboot the tablet AND restart the Miracast dongle.